Mid-July and the weather is now officially hot (in the 30Cs). From the beginning of July onwards the roads start to fill from Friday evenings with weekenders up from Barcelona. Naturally there are tourists from across Europe arriving too, but at the start of July, it's still quiet enough to find a car park place. The really busy period starts in the middle of July all the way to the end of August when everywhere is full. But if you're prepared to walk it's still possible to find more out of the way places. If you've been following the walks, we've slowed down too. We are still walking, but more frequently to the beaches or just in our neighbourhood. Spanish school holidays start at the last week of June and run all the way through to the second week of September - almost three months so we also spend some time travelling back to the UK or more northern parts of Europe. It's actually relatively common and we know of people who do house swaps during July and August. 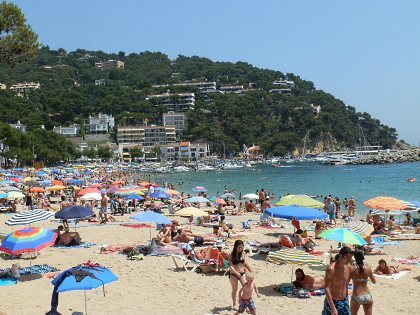 If you're on the Costa Brava all summer, then a couple of weeks somewhere a little cooler where the risk of rain won't ruin the whole summer is an attractive option. The pattern of walks is also changing. We typically walk to the beaches in the evening, just as everyone else is going. Mid-day, like most people here, we're looking for shade. If you are in the woods or out and about, the tracks and paths are more dusty - your feet get covered by a thin crust of fine dust and many of the streams have dried up. As we move into the middle of July, there are the numerous festivals around. Calella de Palafrugell has Havarnes (sea shanties) on the beach with people watching from fishing boats lit with candles on the sea. Calella de Palafrugell also hosts the Cap Roig Music Festival. Elton John was due to open, but has called off with appendicitis. Mark Knopfler is playing one of the other dates too. The local villages also have their Festa Major, the village fete, with activities and naturally sardanes, the national dance of Catalonia. We want to add some descriptions of the beaches - the types of sand, water, facilities, but we also want some proper photos to illustrate. May be, now the trips are out of the way, we'll follow this up a bit more.